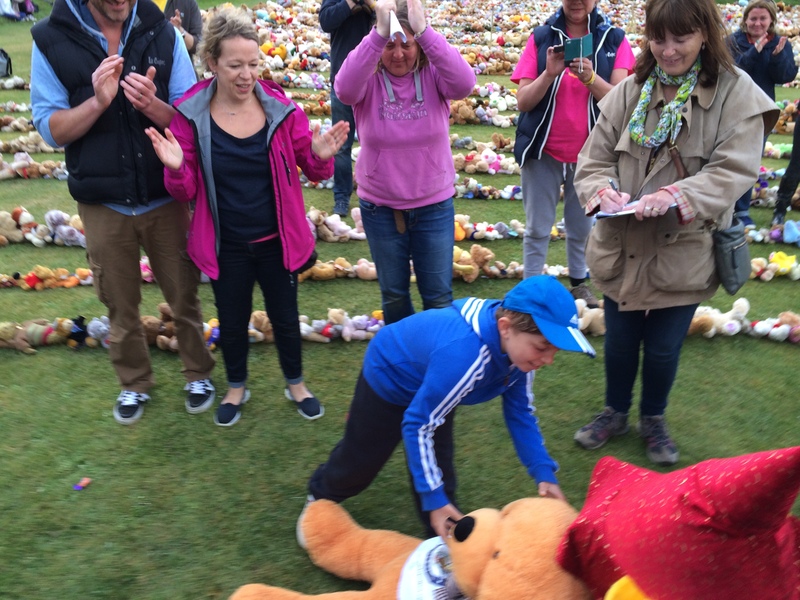 Operation Teddy Bear – World Record SMASHED!!! 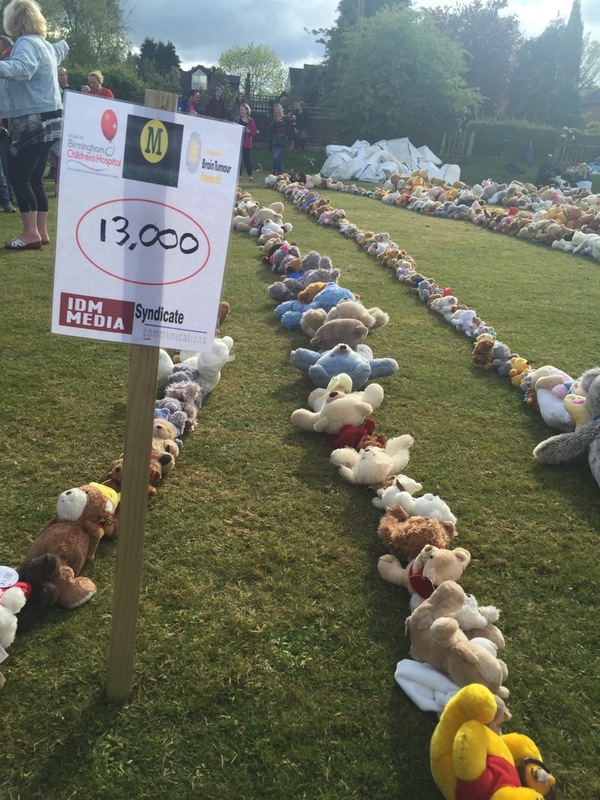 I’ve blogged before about Operation Teddy Bear and the accompanying raising of its awareness with #opteddybear selfies – but yesterday was THE BIG DAY – and is ‘one day in May’ I will never forget!! 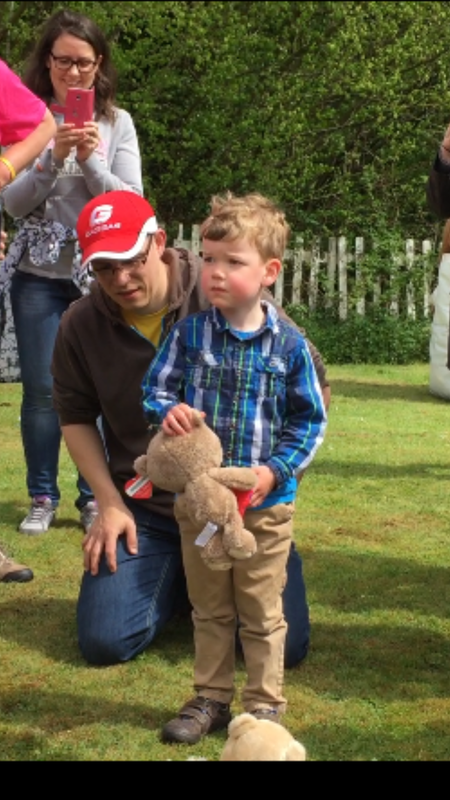 A couple of weeks ago we found out that Finlay was going to need further brain surgery – and just a few days before the big day – so we gave him the choice of whether we postponed, or went ahead without him. The mature, sensible, lovely boy that he is, he recognised how much work had gone into the preparation and told us to go ahead anyway. So on Thursday 30 April Fin had a 7 hour operation. 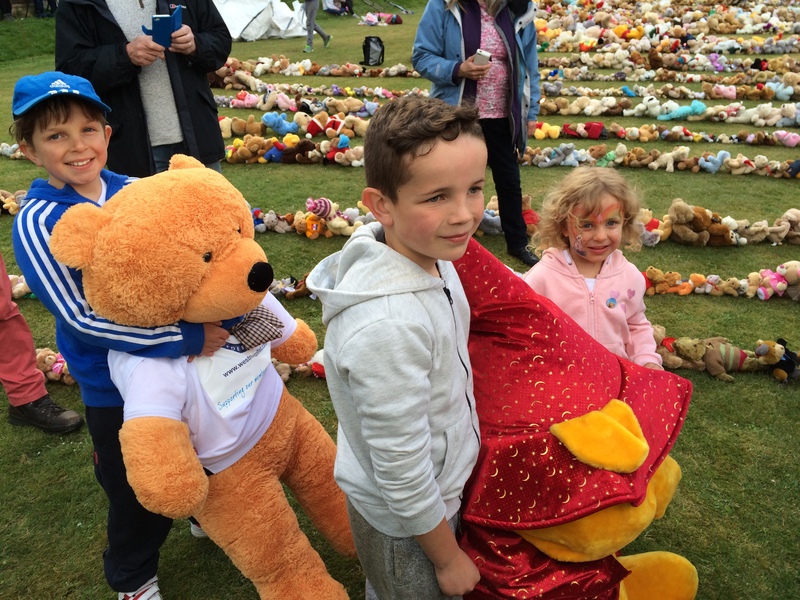 It went really well and he was excited that he could be video linked in to the Operation Teddy Bear event. Then on Sunday May 3rd it was an early – and wet – start at Alvechurch Cricket Club. If we’d arranged for Guinness to come out and witness the event we would have had to pay them a few thousand pounds – and we wanted that money to go to the charities (Birmingham Children’s Hospital and Brain Tumour Research) – so we went down the route of providing loads of evidence to support our attempt instead. This meant independent witnesses were there every step / bear of the way and everything was photographed and videoed. So – off we went!! 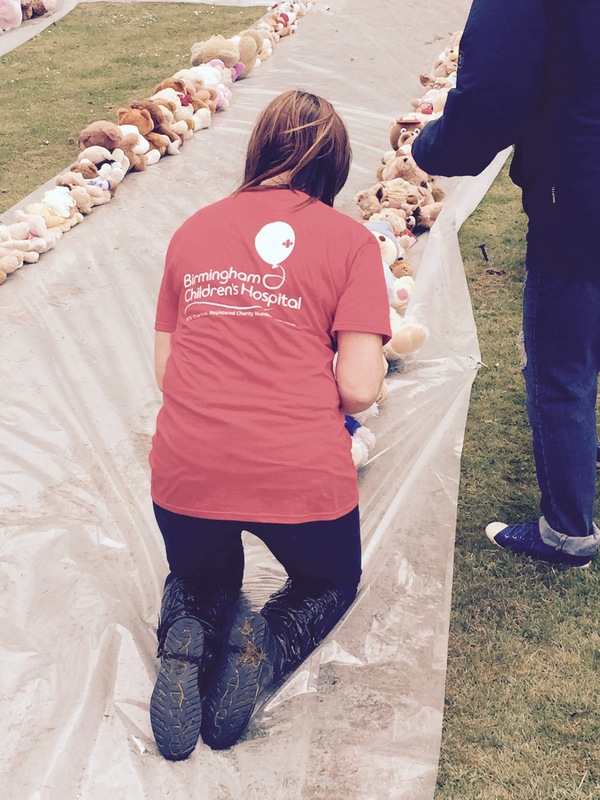 At this point the bears could sit on plastic to stop their bottoms getting wet – those later on weren’t so comfy! All through the first few hours we were able to FaceTime with Fin in his (dry, warm) hospital bed!! 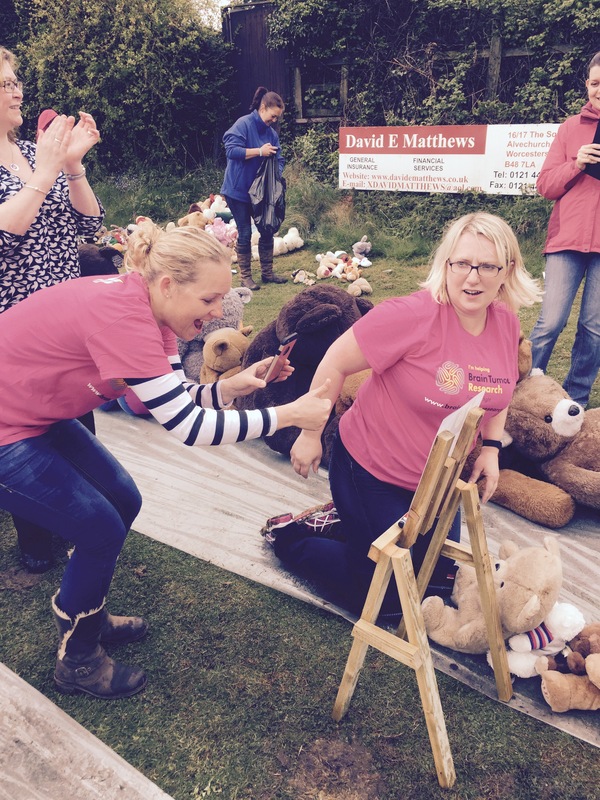 But we weren’t going to stop at just scraping the record – we wanted to SMASH it – so on we went! 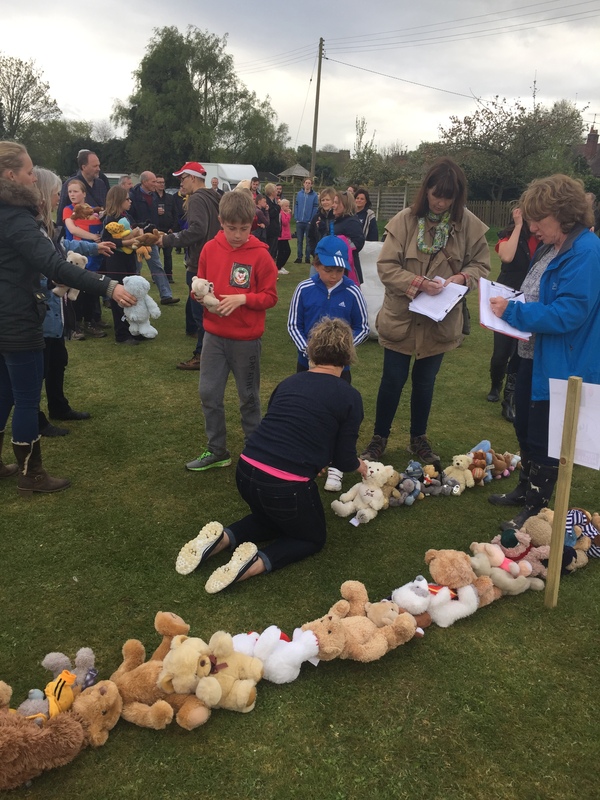 There was a steady stream of wonderful people volunteering to lay bears – and a huge queue of people to help ‘feed’ the layers with bears! 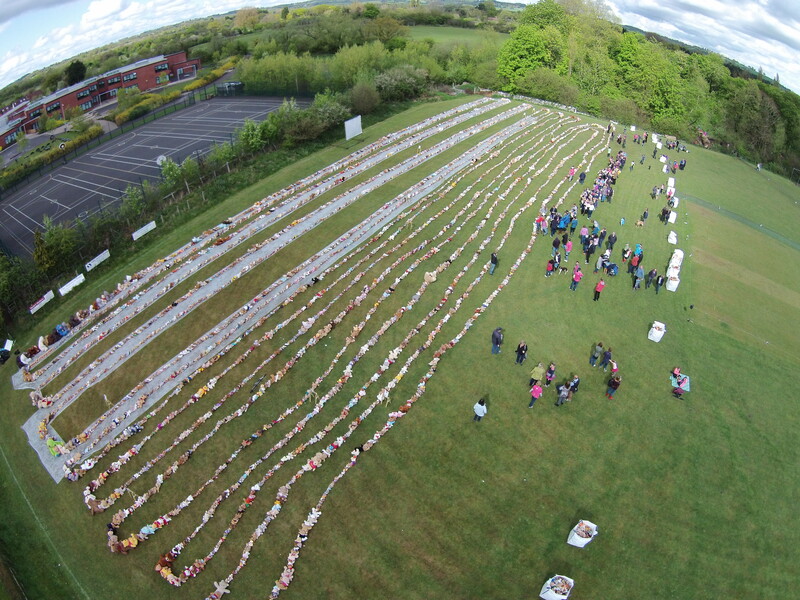 It was the Alvechurch Picnic In The Park in the neighbouring park, so there were loads of locals to come and help and watch and it had the most amazing feel of community spirit. 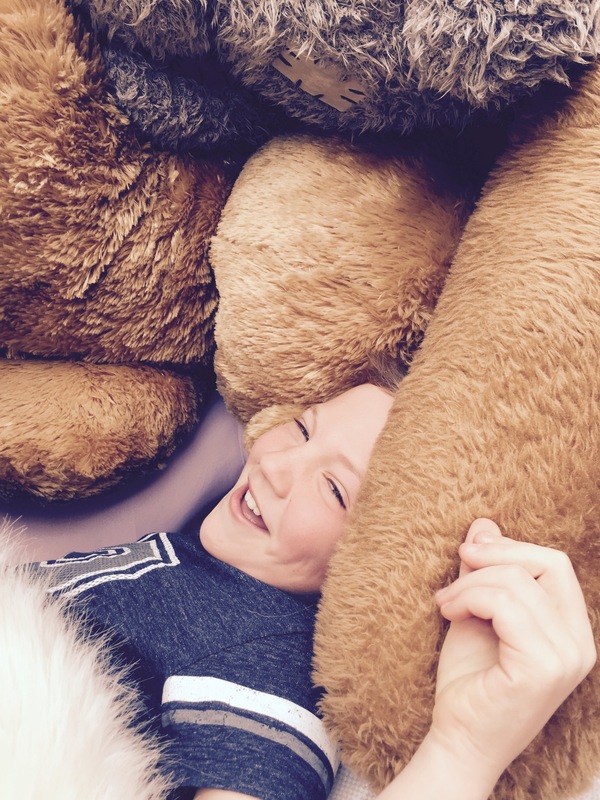 Onwards we went…….bear after bear after bear. 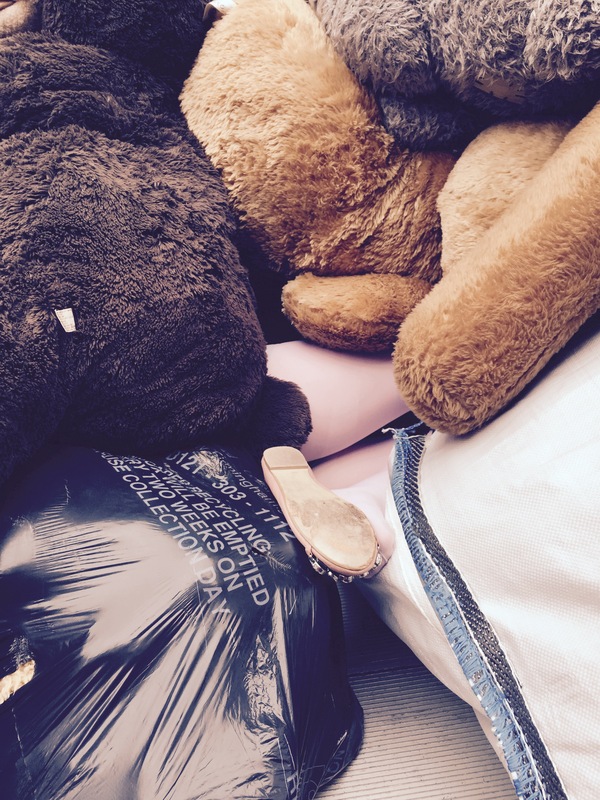 They had to be bears, not any other kind of stuffed toy – and they had to be touching at all times. I took my role as bear police very seriously (I suspect there will be children in the school playground this week pointing at me saying ‘there’s that nasty lady who shouted at us to keep away from the bears’!!) but we couldn’t risk the line being broken. Then, there was some real excitement – someone really important had arrived at the attempt. IT WAS FINLAY!!!! The whole ‘wifi is down’ had been a ruse, in fact the Church family were bringing Finlay out of hospital! So 3 days after 7 hour brain surgery, he’d done so well, he’d been allowed out – and he was able to come and join us. Cue LOADS more weeping from me and the rest of the team!! 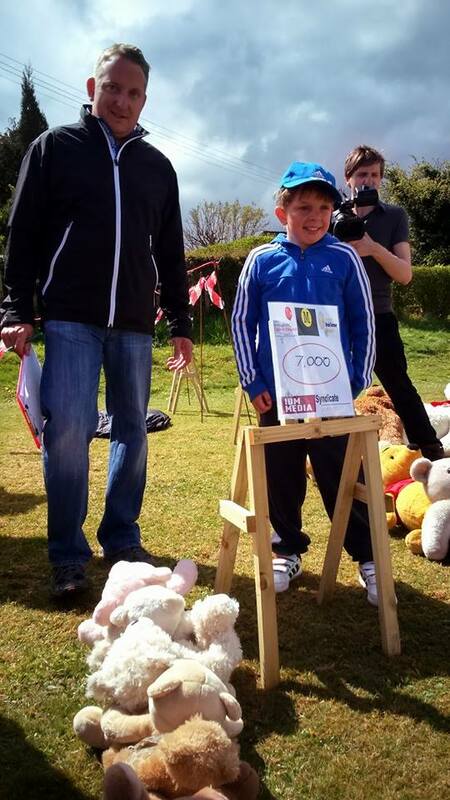 He was well enough to lay some bears – here he is with one of our independent witnesses, having hit the 7,000 marker! and here he is ‘feeding’ bears to his Mum! 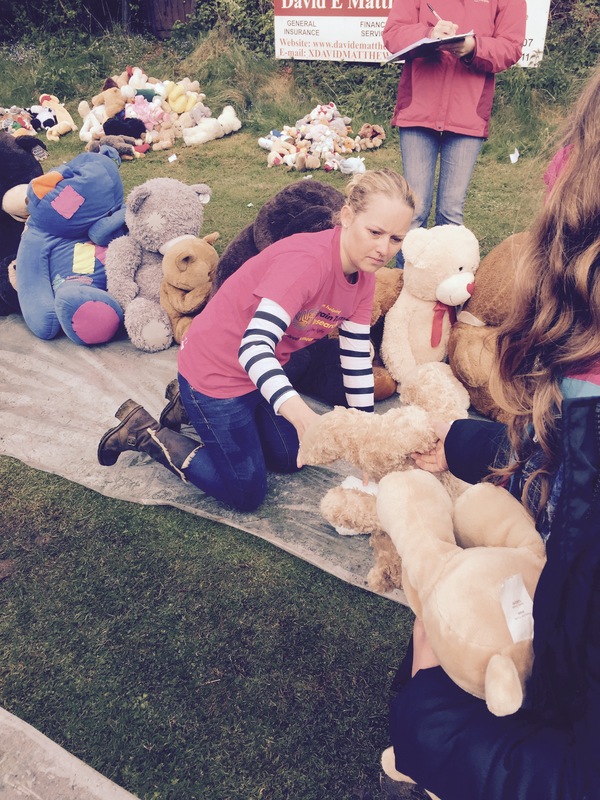 Still we were laying bears – those that had been donated over recent weeks by generous people all over the country – but also brought along on the day. We’d even sourced a generator and some floodlights in case we needed to keep laying after it went dark, and were on our 3rd pair of independent witnesses!! These are photos from our phones, so not the best quality in the world, but I think give a really good feel for the day. It was an amazing day to be part of – and really highlighted how much the entire community is behind Fin and his family. All of the evidence will be sent off to Guinness for them to check and hopefully issue Fin his certificate – and getting in the printed edition of the Guinness Book of World Records itself is his dream. 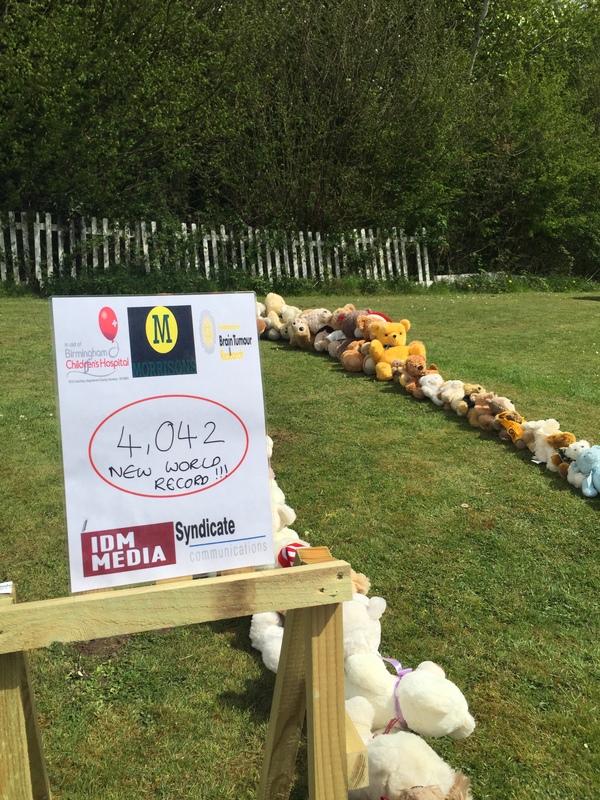 But the record attempt was only part of it – the main reason was to raise awareness and funds for Birmingham Children’s Hospital and Brain Tumour Research – so if you feel inspired to donate, the Just Giving pages are still accepting! It’s now the morning after the day before. 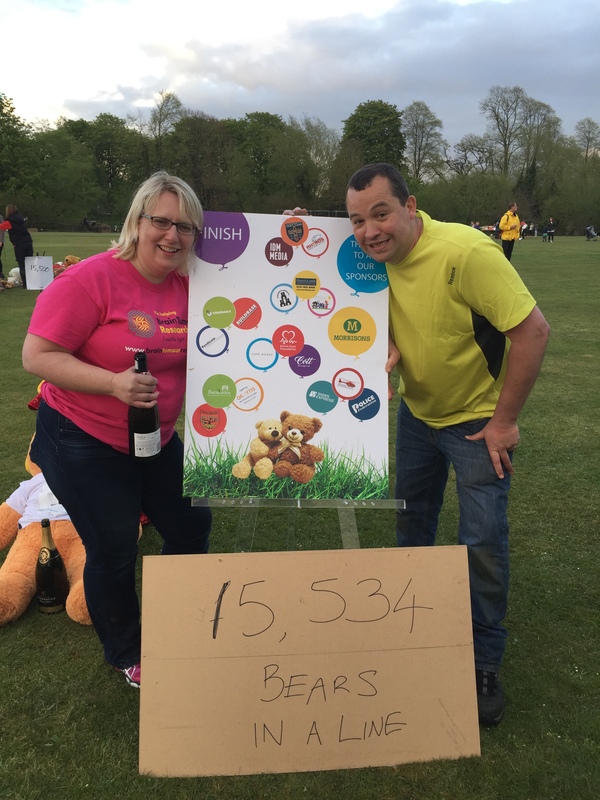 My husband and I (and I expect other people around the village) are struggling to walk today (my Fitbit shows I walked 12 miles yesterday – I could have just done the Birmingham 10k – which was also on yesterday – twice instead!!). The longest time I sat down in the 14 hours we were there yesterday was for a wee!! 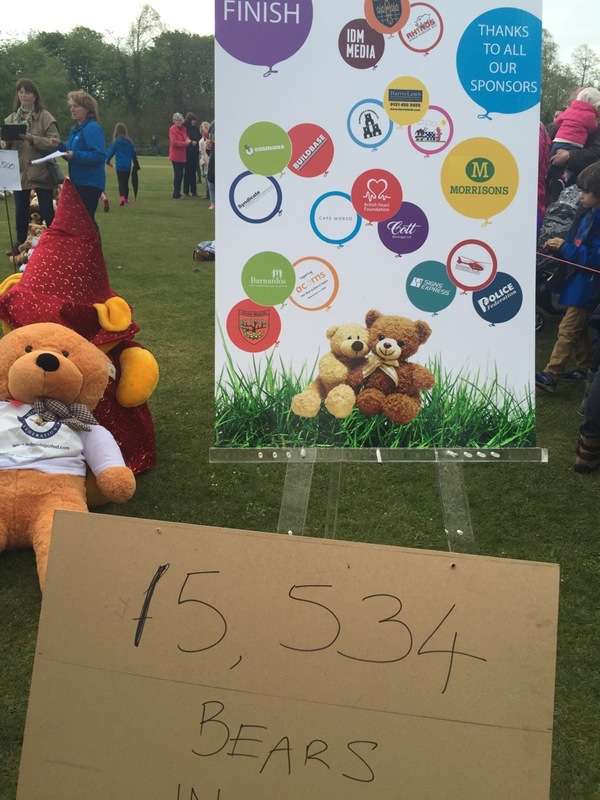 We also have 15,534 wet teddy bears to dry and distribute to the various charities who have supported us – but pretty soon it won’t be ‘All About the Bears‘ anymore…………….. The category for The Gallery over on the Sticky Fingers blog this week is ‘one day in May’- and this is one day in May that I will never, ever forget! What a fantastic achievement, you must be absolutely shattered but absolutely worth every emotional moment I think. Thank you so much for your kind words, they made me weep (still feeling really emotional about the whole thing!) and for your lovely donation.